There is this rather magical, special moment in Tuscany where the seasons are changing—in one moment you can still feel that warmth of late summer, and then it's suddenly chilly and damp, the leaves drop and smoke from countryside chimneys can be seen. 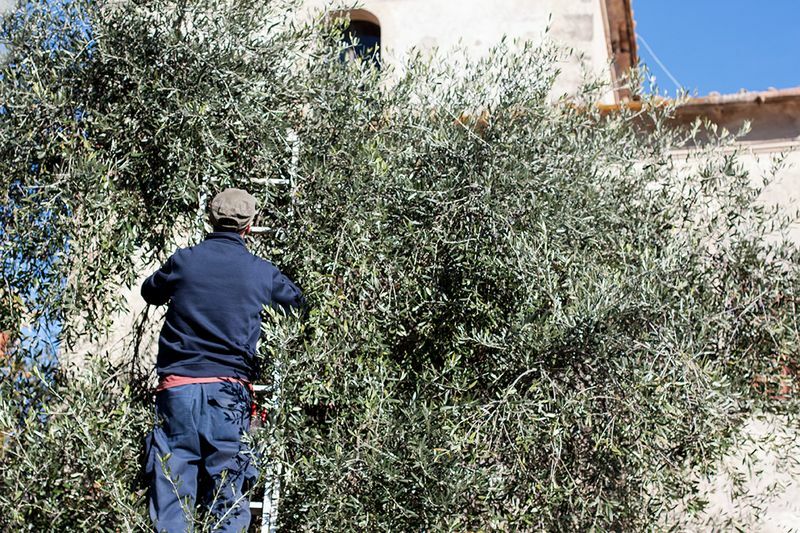 Sometime in between this moment is when Tuscan olive trees are being raked and shaken for the fruit to drop and crates of olives are taken to the local frantoio, the olive oil mill, where the fruit is pressed. The thick, green liquid of the prized first press is collected and ready to be dipped with slices of toasted, garlic-rubbed bread. At this precise moment, you also see this clash of seasonal produce at the market: fresh, magenta-speckled Borlotti (cranberry) beans still in their pods, reminiscent of summer; long, oblong pumpkins sold by the slice; and the first, young leaves of cavolo nero (Tuscan kale). Scenes like these are a reminder of why dishes like the zuppa frantoiana (or "olive oil mill soup") exist, and why this particular set of ingredients are found together in the pot. It goes without saying, but olive oil is the star of this otherwise simple minestrone. 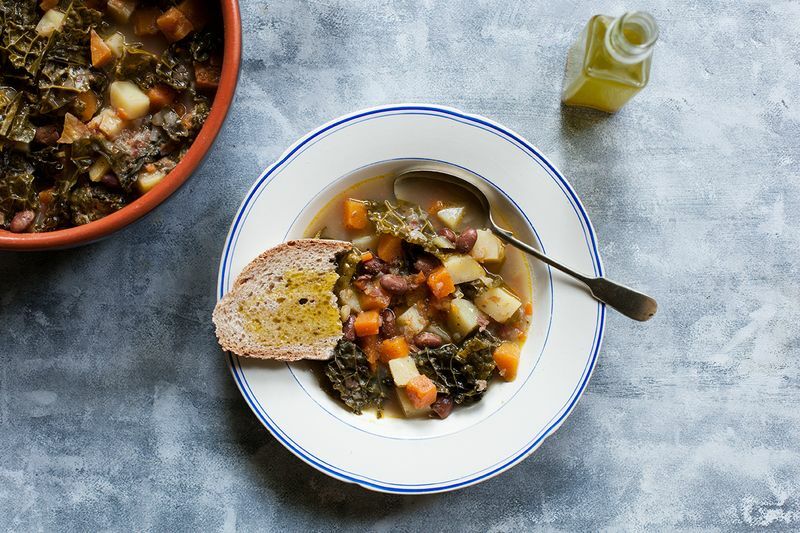 The podded cranberry beans are blended into a smooth puree, after being cooked with a soffritto of onion, celery, and carrot; then, pumpkin, potatoes, and cavolo nero are added to the pot, topped up with water, and is slowly cooked until the cavolo nero gives way completely. The soup is ladled into bowls and served with a drizzle of new olive oil and toasted slices of bread, rubbed with garlic and doused in more oil. 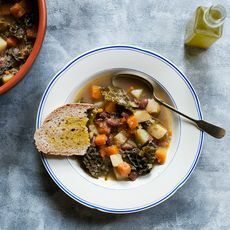 It's a delicious way to greet autumn and old traditions in Tuscany, but of course, you can also use it as a guide to create your own autumnal minestrone—blending the beans gives the soup a lovely thick and silky texture, but if you don't have cranberry beans on hand, cannellini beans work nicely and so do chickpeas. 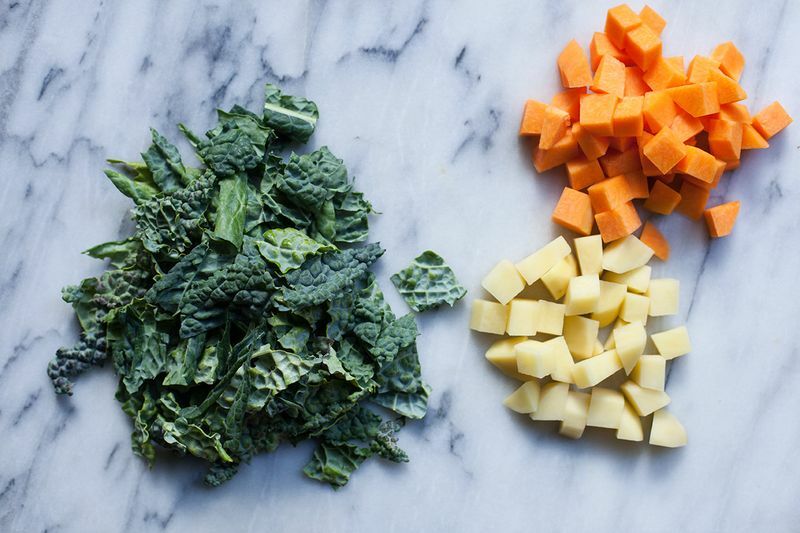 Cavolo nero can be substituted with any other leafy green of your choice, and butternut squash is a very close alternative to the kind of pumpkins you can find in Tuscany. If you want to add a bit of pork, some pancetta or pieces of pork fennel sausage, cooked off separately until crisp and browned, would be most welcome in this soup. This is yet another reminder of how so many rustic, country soups in Italy came about—using what you happened to have on hand. This article was written by Emiko from Food52 and was legally licensed through the NewsCred publisher network. Please direct all licensing questions to legal@newscred.com.